As part of an initiative to improve STEM education in the district I work at, a local parent group worked with our local 4-H chapter to provide training for community members and teachers interested in running after school STEM programs. I participated in the STEM energy training (see my previous post “Fun With STEM”) and learned quite a few PBL lessons that I could do with kids. This past week I ran two after school “The Magic of Electricity” workshops with elementary students. It was a lot of fun and I was able to make some observations about doing PBL with elementary kids. The first thing I noticed was the kids strong curiosity about anything put in front of them. Our first project involved making a flashlight from foil, a battery, and a light bulb. However, once kids got this figured out they were immediately on to experimenting with their electricity kits even before I could get the next task explained. I didn’t bother to reign them in as they were so excited about making circuits with buzzers, diodes, motors and switches. 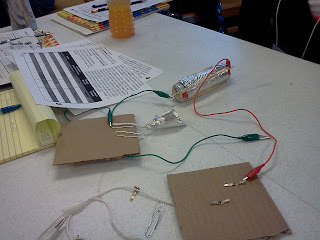 They really loved it and some of them got very inventive and were able to make some very complex circuits with self-engineered switches made from paper clips, cardboard and fasteners. To me this engagement and ability to explore and construct knowledge is what makes PBL so attractive. While this was only a short intro class, it did make me wonder about to what extent I should have been introducing the academic language and more formal laws and theories underlying what the kids were experiencing with in their projects. I don’t have a whole lot of experience with elementary students so I wonder to what extent they are capable of understanding more abstract concepts like electron movement. I also wonder how useful those abstract concepts would be for them at this point and at what point in the sequence of learning about electricity it makes sense to delve into the complexities of electricity such as alternating currents, electromagnetic fields, etc.